Tax-exempt organizations must follow strict federal guidelines, and the formation and management of a tax-exempt organization can be a daunting and complex undertaking. Many difficult legal issues can be avoided by first seeking the advice and counsel of a knowledgeable attorney with experience in tax exemption laws and regulations. The Ingersoll Firm represents tax-exempt entities with respect to a wide range of tax-related matters. Our attorneys are well equipped to handle even the most complicated concerns that arise, and can identify ahead of time any issues that may create problems in the future. 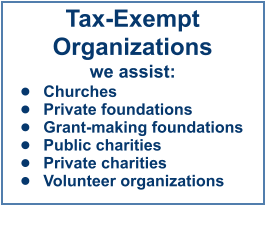 We provide a broad range of tax and corporate services for tax-exempt organizations, including formation under state law, obtaining a determination of tax-exempt status from the Internal Revenue Service, assistance in qualification as a public charity or private foundation and other ancillary matters, including establishment of a board of directors and officers. We also counsel clients retaining tax-exempt status for nonprofit organizations and dealing with various legal restrictions on nonprofits, including the intermediate sanctions, private inurements, private benefit, and unrelated business income tax rules. Our firm also counsels the use and operation of private foundations in conjunction with larger estate planning objectives. We have extensive experience in federal tax-exemption law, and our firm can help you form and manage your nonprofit entity. Proper formation and management of a Tax Exempt Entity is the best way to make sure you are complying with all federal, state and local laws. Contact Ingersoll Firm if you need help establishing or maintaining a nonprofit organization. We have the expertise to keep you in compliance while maximizing your giving potential. 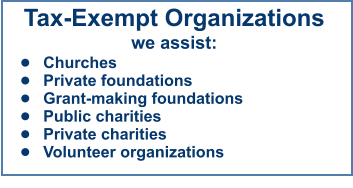 We provide a broad range of tax and corporate services for tax- exempt organizations, including formation under state law, obtaining a determination of tax-exempt status from the Internal Revenue Service, assistance in qualification as a public charity or private foundation and other ancillary matters, including establishment of a board of directors and officers. We also counsel clients retaining tax-exempt status for nonprofit organizations and dealing with various legal restrictions on nonprofits, including the intermediate sanctions, private inurements, private benefit, and unrelated business income tax rules. Our firm also counsels the use and operation of private foundations in conjunction with larger estate planning objectives. We have extensive experience in federal tax- exemption law, and our firm can help you form and manage your nonprofit entity.